Are you searching for faith, answers, hope, an identity? A poet, brother and teacher; perhaps the Tall White Man can help you in your journey during this chilled out session with Arabic coffee and spoken word poems. This session is created for the youth by the youth. It is a safe space for the youth to ask questions regarding faith, spirituality and this crazy thing called life. So who is The Tall White Man? It's none other than Yahya Rhodus from Zaytuna College and Seekers Guidance. 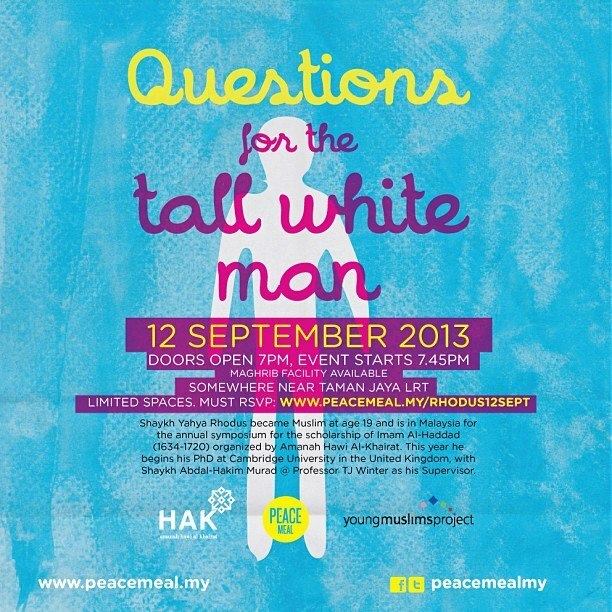 'Questions for the Tall White Man' is a chill out session with PeaceMeal Malaysia and Young Muslims Project and of course, our guest of honour Yahya Rhodus. When? Thursday, 12th September 2013. How much does it cost? It's free! All you need to bring is an open mind, the spirit to seek knowledge and some challenging questions. That sounds like a cool event!